JSO Sing Out 60th Pete Seeger, Dreadnought Steel String Guitar from Martin & Co.
C.F. Martin & Co. announces the introduction of two new Custom Artist Edition guitars: the Martin JSO! 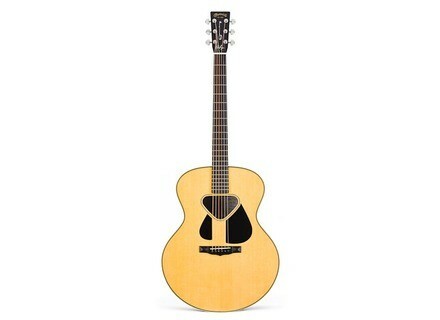 Sing Out Pete Seeger (6-string) and the Martin J12SO!Sing Out Pete Seeger (12-string). The guitars mark the 60th anniversary of Sing Out!, the magazine, songbook publisher and syndicator of traditional music radio shows that Seeger helped found in 1950. To mark this milestone, 120 of these guitars are being built, signed by both Seeger and Martin Chairman and CEO Christian Frederick (Chris) Martin IV. The JSO! and J12SO! 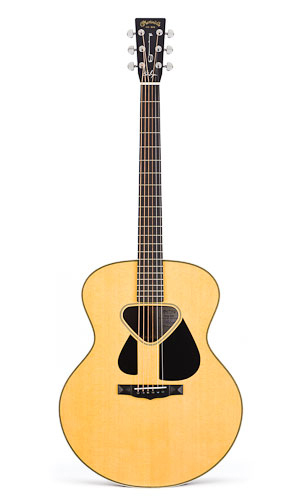 models have Martin's Grand Jumbo body style, built of solid woods. The top is built of Sitka spruce, East Indian rosewood on the back and sides, a mahogany neck with unadorned black ebony fingerboard, and a polished East Indian rosewood headplate. The headplate includes the familiar gold C. F. Martin & Co. logo, as well as a banjo sketch drawn by Seeger and a replica of his signature inlaid in mother of pearl. The triangular sound hole is surrounded by a black/white/black/white fine line rosette, and the top of the sound hole is encircled by bold herringbone purfling and grained ivoroid binding. Both models are finished with a polished gloss lacquer finishes, with aging toner on the tops to enhance their vintage style and are protected in Vintage Series Geib-style hardshell cases. Each of the limited edition (120) custom guitars will be numbered in sequence with the edition's total number produced. For more information on Sing Out! 's 60th Anniversary, visit www.singout.com/60years, and on these Custom Artist Editions, visit www.martinguitar.com. [NAMM] Epiphone ES-339 Epiphone introduces the ES-339, a new semi-hollowbody. [NAMM] New ESP 7- and 8-String Models The new EC-407, EX-307, and V-307 takes three of ESP's body shapes and offers them in 7-string versions. [NAMM] New Korg Products Korg (Summer NAMM booth 800) is displaying the Pitchblack+ guitar and bass pedal tuner, their Pitch Clip, and MA-1 Solo Metronome.